A congenital malformation of the spinal cord. Results due to abnormal splitting of the notochord, possibly due to an obstacle between the endoderm and ectoderm encountered during migration. 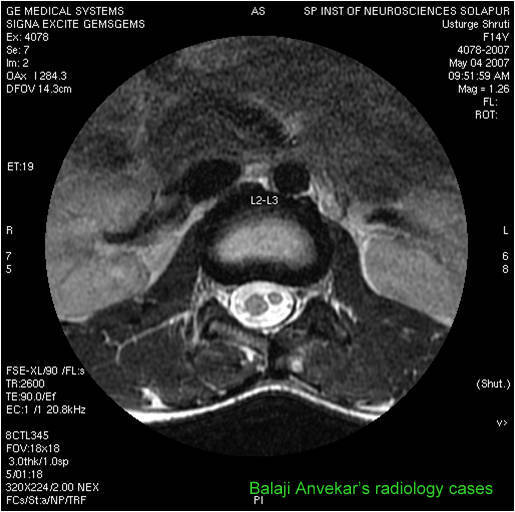 Most commonly seen in upper lumbar, where is it it is generally associated with cord tethering , making it more symptomatic. The two hemicords may not be equal in size , usually reunite below the level of diastematomyelia. Type I : hemicord enclosed in two separate dural sheaths with a bony, cartilaginous or fibrous spur in between. Type II : hemicord enclosed in same dural covering, no spur. In 85% associated spinal anomalies include tethering, myelocele/myelomeningocele, lipoma, dermal sinus, dermoid or epidermoid, or meningocele. rally nice info.. does children with such anomaly survive long ?? MRI can't replace CT completely. 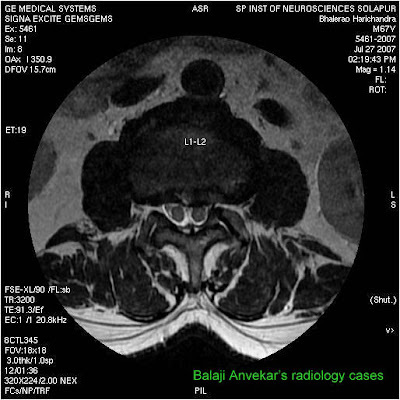 © Dr Balaji Anvekar’s Neuroradiology Cases. Awesome Inc. theme. Powered by Blogger.